Just as many of today’s young boxing fans became interested in the sport of boxing because of Mike Tyson, I started watching boxing because of Muhammad Ali. Ali was perhaps the most charismatic and influential boxer in history. Because of his outspoken personality and his stance against the detested war in Vietnam Ali’s pulpit of popularity extended far beyond the boxing ring, often overshadowing a generation of great fighters in the lower weight classes. The fighters of that era were among the greatest crop of boxers to ever appear at any one time in the history of the sport. In past articles I have argued that the legendary fighters were as good as modern fighters, and often misunderstood by today’s typical boxing fan who has not put in the time doing the necessary research to know their careers and those of their opponents. When looking at the fighters of my generation it is easy to see why boxing fans and writers who grew up watching the modern’s could under-estimate those of the past, the fans know how good the fighters of the Ali and post Ali era were. Here we shall look at those fighters of the 1970’s up to the very early 1980’s. The 1970’s were perhaps boxing's greatest era for heavyweights with Muhammad Ali, Joe Frazier, George Foreman, and Larry Holmes all in championship fights. There was also a score of good quality top contenders such as Ken Norton, Earnie Shavers, Ron Lyle, Jimmy Young, and Jerry Quarry who were all active in this period. The 70’s were truly the “Golden Age” of heavyweight boxing. Due to the popularity of Muhammad Ali many of his contemporaries and those that followed him did not receive the recognition due them. 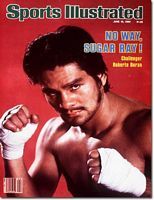 Ray Arcel said, “When you think of great fighter’s never forget there was a guy by the name of Roberto Duran. He was never given the opportunity to really display his wares because at his peak he was overshadowed by Muhammad Ali.” Arcel rightly pointed out that even the best of that period were not as appreciated as they should have been because their primes occurred during the era of Muhammad Ali. Division by division this era remains among the greatest in boxing history. Here is a list of the best fighters of a generation. This group rates with any of those that came before or after them. The first fight I saw as a kid was Muhammad Ali-Joe Frazier March 8, 1971. The Ali of the first Frazier fight was a great fighter and there is little doubt he would have beaten a great many champions that night. He would be successful throughout the 1970’s beating Frazier 2 of 3 times, upsetting undefeated George Foreman, and becoming a 3 time lineal champion. The argument can be made that the Ali of the early 1970’s was better than the 1960’s version, he was more filled out, physically stronger, fought more flatfooted at times which means he sat down more on his punches and he proved he had the chin and heart of a champion in this era. 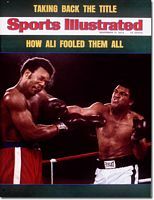 The Ali of the 1960’s may still have been better due to his phenomenal movement, but the Ali of the 1970’s was without question still among the 3 greatest heavyweights of all time. Mike Spinks is almost forgotten now because in his own time he was overshadowed by the exploits of his older brother Leon, and in his last fight he was knocked out inside one round by Mike Tyson. However, as light-heavyweight champion Mike Spinks was unbeaten defeating an impressive array of champions and contenders that included Marvin Johnson, Eddie Mustafa Muhammad, and Dwight Muhammad Qawi. He also legitimately upset Larry Holmes in their first meeting to become the first reigning light-heavyweight king to win the heavyweight championship. Spinks was a great fighter who possessed excellent height at 6’2 ½” with a 76” reach and he knew how to use it. He possessed a devastating right hand punch nicknamed “The Spinks Jinx.” He looked awkward at times but could throw punches from any angle. Michael was never hurt or knocked off his feet as a 175 pounder. He could fight going forwards or backwards, inside or out, he was a complete fighter. Mike Spinks by any estimation is one of the 5 greatest light-heavyweights of history. There are really two choices for the best middleweight of the 70's to early 80's, either Carlos Monzon or Marvin Hagler, take your pick. Both were dominant champions with long title reigns. Both had impregnable chins and were never knocked out. Both possessed a good jab and a strong right hand punch. I prefer Monzon because he was a superior technician and a better defensive boxer. Either man would be a good selection to represent the Ali and post Ali era generation of fighters at middleweight. My selection Carlos Monzon went undefeated over the last 84 bouts of his career and retired unbeaten as champion. He made 14 successful title defenses. He faced a murderers row quality of opposition as champion defeating Nino Benvenuti, Emile Griffith, Bennie Briscoe, Jose Napoles, and Rodrigo Valdez. Monzon was a very tall middleweight at 6’2” and he knew how to use his physical advantages. Monzon is rated by many ring historians among the 5 greatest middleweights of all time. Back in early days of boxing the middleweight limit was 154 pounds. Bob Fitzsimmons raised the limit to 158 and it is now 160. The Jr. Middleweight class (154 pounds) was created in 1962. Looking at the list of title-holders the argument can certainly be made the Thomas “Hitman” Hearns was the greatest 154-pounder in history. Hearns was clearly at his peak at this weight. He defeated Wilfred Benitez for the WBC title and defended it by destroying legendary Roberto Duran. It was the only time in his long and illustrious career that the real Duran was ever knocked out. 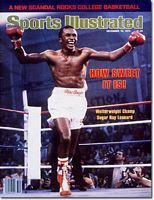 Hearns peak record as Jr. Middleweight champion was 40-1 with 34 knockouts. Hearns was over 6’1” with an incredible reach of 76.” His long left jab was hard to avoid. His perfectly thrown straight right cross was one of the most awesome punches in boxing history. Hearns could box at range, and was a debilitating knockout artist. Hearns was not a good defensive fighter and he was vulnerable inside, but he was a master at outboxing and a terror on offense. 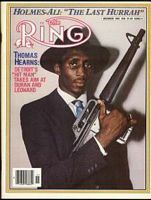 I consider Tommy Hearns as the greatest 154-pound champion of all time. Leonard, the other “Sugar Ray,” was one of the greatest welterweights of all time by any standard, easily ranking among the top 5 fighters ever in this class, and is arguably number 2 behind the original “Sugar Ray” Robinson. In his career Leonard defeated 4 current or future Hall of Famer’s Wilfred Benitez, Roberto Duran, Thomas Hearns and Marvin Hagler. Their combined record was 204-3-3 when he beat them. He also bested some outstanding welterweight contenders on the way to the title such as Randy Shields, Pete Ranzany, Andy Price, and Armando Muniz. Leonard was a master boxer who had it all, speed, balance, footwork, a precise jab, crunching power in his left hook, nice combinations, a good chin, endurance, and the proven heart of a champion. The 140-pound class was created by the New York State Legislature as part of the Walker Law, which reestablished boxing in the state in 1920. A lot of great fighters have held this title including Barney Ross, Carlos Ortiz, Wilfred Benitez, Julio Cesar Chavez and Oscar Delahoya. Most of them held the title while moving up from other divisions or on the way to larger weight classes. It has been my contention that there have been very few champions who have held junior titles exclusively that deserve to be considered with the label of an “all time great.” Most truly great fighters that have won Junior titles also won titles in senior weight classes. One of those junior champions who did not win a regular division title but deserves the accolades of an all time great is Aaron Pryor. Aaron moved up from lightweight to challenge veteran Jr. welterweight champion Antonio Cervantes for one reason, none of the lightweight titleholders wanted to fight him. At his peak Pryor was undefeated going 36-0 and made 10 successful title defenses before retiring into inactivity and alleged drug abuse. His final career mark was 39-1 with 35 KO’s. Pryor was a speedy swarming puncher who threw them from all angles. He had very quick hands and could box as well as punch. He also had a strong chin and the endurance to match his high activity rate. Pryor easily rates among the top 3 ever in this weight class and is arguably the most unbeatable 140-pound champion ever. Many modern and veteran boxing analysts consider Roberto Duran to be the greatest lightweight champion of all time. He easily ranks among the top 3. His peak record was 72-1 with 56 knockouts, during which time he reigned undefeated as world lightweight champion for 6 years and also won the world welterweight title. As lightweight kingpin he successfully defended the title 12 times, 11 by knockout. In his career he beat Ken Buchanan, Esteban Dejesus, Sugar Ray Leonard, and Iran Barkley. Duran was more than just a strong infighter; he was a master at slipping punches and counter-punching. Only Joe Gans and Benny Leonard rate with Duran as equal peers at 135 pounds. Apologies to Pernell Whitakker who could make them miss, but could not make them pay like those guys could. Was there ever a more dominant 130-pound champion? Arguello was at his best at this weight. A classic boxer-puncher who threw every punch with textbook perfection, Arguello had the ability to dissect any opponents style, exploit their flaws and coolly destroy them over the course of a fight. At 130, he also had explosive power. At 5’ 10” with a 76” reach Arguello was an extremely tall and lanky puncher at this weight. Arguello was a triple-crown champion winning titles at Featherweight, Jr. Lightweight and Lightweight. As 130 pound champion he made 8 successful title defenses winning 7 by knockout. In his career he defeated Alfredo Escalera, Bobby Chacon, Ruben Castillo, Cornelius Boza-Edwards, Jose Luis Ramirez, Jim Watt, Ray Mancini, and Andy Ganigan. Of his 82 wins 65 were by knockout. Arguello is rated by the author as the greatest 130-pound champion in history. Sanchez was a meteor that lit up the boxing sky only to pass by all too quickly. Sanchez reigned as Featherweight champion from 1980-1982. He never lost a title fight. Like the ring immortal Stanley Ketchel, Sanchez is one of the rare champions to have died while holding the title. He had made 9 successful defenses of his featherweight championship when he died in a tragic car accident at the age of 23. Sanchez was not the typical Mexican fighter, although he possessed a granite chin and a champion’s heart he was not an aggressive pressure fighter, instead he was a controlling defensive boxing strategist who relied on footwork and sharp counter-punching to outbox his opponent’s. He twice beat the hard-hitting champion Danny “Little Red” Lopez, and defeated top notch contenders such as Patrick Ford, Juan Laporte, and Roberto Castanon. In his legacy fight he took apart one of boxing’s best pound for pound fighters of the period when he stopped previously undefeated Wilfredo Gomez (32-0-1, 32 ko’s) in 8 rounds. In his last fight before his untimely death he defeated Azumah Nelson who would go on to have a great career as Featherweight and Jr. Lightweight champion. Sanchez easily rates among the top 10 Featherweights of all time and is arguably among the top 3. The 122 Jr. Featherweight division was established in 1976. At 5’5” Wilfredo “Bazooka” Gomez was a natural for this division winning the title in 1977. Gomez was an amazing fighter, exceptionally quick and with great power. He could stand and trade or box effortlessly with lateral movement. Many understand that he was a strong puncher but fail to realize what an outstanding boxer he was. Gomez was a complete fighter. He made 18 successful title defenses winning 17 by knockout. This remains a division record. He had 3 legacy fights. The first was against bantamweight champion Carlos Zarate. Both men were undefeated. Zarate was 54-0 with 53 knockouts. Gomez, 21-0-1 with 21 KO’s. Gomez halted the great Zarate in 5 rounds. He lost to Sal Sanchez in an upset. His greatest fight may have been his 1982 war against Lupe Pintor, which is considered one of the greatest fights of the decade of the 1980’s. It was a titanic struggle that saw Gomez triumph with a convincing 14 round knockout. Gomez is clearly the greatest 122-pound fighter since the creation of the weight class. Bantamweights: Carlos Zarate Not only was Carlos Zarate one of the best fighters of the 1970’s he is one of the greatest bantamweight fighters of all time. A relentlessly stalking boxer-puncher Zarate methodically broke down his opponent’s before knocking them out. He was a tremendous hitter as his record of 63 knockouts in 66 wins attests to. He won the title in 1976 and lost it on a controversial decision in 1979. His over the weight showdown with Alfonso Zamora was a clash of unbeaten bantamweight title claimants. Zarate knocked out Zamora (29-0, 29 ko’s) in 4 rounds flooring him 3 times in the process. Carlos ventured up to 122 pounds and lost to Wilfredo Gomez in another battle of unbeatens. Zarate made 9 successful defenses of his bantamweight championship before losing it on a close, controversial decision to Lupe Pintor. Zarate is easily one of the 5 greatest bantamweights in history. The Mexican born Canto was a busy fighter who wore down his opponents with a high work rate, although he lacked a powerful punch. At his peak he had a 4 year unbeaten streak and made a division record 14 successful title defenses. Most of his career defeats were in the first two years and at the end of his career, losing 4 of his last 5 fights. But at his peak was a highly successful fighter defeating quality opposition like Shoji Oguma, Betulio Gonzalez, Antonio Avela, and also drew with the fighter who took his title Chan-Hee Park. Miguel Canto is considered by some historians among the top 5 all-time Flyweight champions. Take a long look at the names on this list. Muhammad Ali, Mike Spinks, Carlos Monzon, Thomas Hearns, Ray Leonard, Aaron Pryor, Roberto Duran, Alexis Arguello, Salvador Sanchez, Wilfredo Gomez, Carlos Zarate, and Miguel Canto. This group of champions could stand against those of any era and do quite well. The fighters of the 1970’s to about 1982 are a very elite group of special fighters. When I was young there were truly great, great fighters in every division. That cannot be said about every division in boxing today. While it may be true that everyone thinks the fighters of their youth were the best, that doesn’t apply here. Division by division ask yourself how the fighters of today would do against the great fighters of this era? What heavyweight fighting today would beat the Ali of 1971-74? Who would beat the Joe Frazier of 1971 or the George Foreman of 1973-74? What heavyweight since his time was better overall than Larry Holmes? Would Antonio Tarver beat the Mike Spinks of 1981? How would Tarver do against Spinks competition? Could he withstand the heavy handed powerful punches of Marvin Johnson? Would he be able to outbox Eddie Mustafa Muhammad? How about John Conteh? Would he be able to keep a beast like Dwight Qawi off him? Would Jermain Taylor have any chance of beating the tall, efficient and powerful technician that was Carlos Monzon? Could he beat Marvin Hagler? Would Zab Judah be favored over Sugar Ray Leonard? Who would you take at 140 Floyd Mayweather Jr. or Aaron Pryor at his peak? Mayweather is the best P4P fighter in the world today, but certainly Pryor is the more proven fighter at 140 pounds as of this writing. What shot would Diego Corrales or Jose Luis Castillo have against the peak Roberto Duran of 1978? Duran could box, was a master at slipping punches, proved he understood how to apply strategy in the ring, and not only did he have “hands of stone” but he also had a cast iron chin. Could Corrales or Castillo either one defeat Duran’s main rival Esteban Dejesus who was a master boxer with a great left hook? DeJesus had the skills and ability to be champion in many era’s. Would Erik Morales defeat Alexis Arguello at 130 pounds? No way. 130 is probably not Morales best weight while Arguello was just too powerful at his peak in this division. Was anyone better at 122 than Wilfredo Gomez? What featherweight today would be favored over Salvador Sanchez? Maybe there are better flyweights than Miguel Canto but who made more defenses at 112? It is likely that not all of the champions of my youth would go undefeated against the fighters of today, but they would indeed be favored and highly successful in most hypothetical match ups.